Crabgrass is a tenacious and aggressive annual plant whose properties as a monocot closely resemble those of our desired turf grasses. In New England crabgrass generally germinates about the first week of May. Toward the end of August and through September undisturbed crabgrass plants will produce seed heads thus insuring next years crop of crabgrass plants. The seeds of the crabgrass plant are very small. Crabgrass is killed with the fall frosts leaving only a brown crab-like skeleton in its place. Whether you intend to use herbicides or mechanical means, control of crabgrass in the lawn begins in the fall. September through early October present the prime conditions needed for lawn seeding and restoration. Because many of the crabgrass pre-emergents used in spring are photosensitive, a lawn thick in desired species is essential to shade the soil and protect the crabgrass pre-emergent. Any areas that show bare soil or have a high concentration of crabgrass should be seeded in the fall. Surprisingly, it is not necessary to remove the crabgrass plants currently growing in the lawn prior to seeding. The mature and naturally dying crabgrass plants will protect the new desirable grass by stabilizing moisture and temperatures. 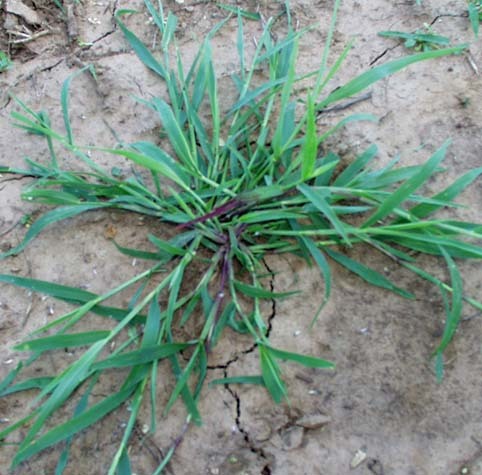 Competition from crabgrass seedlings will not occur until the following spring. An application of pre-emergent herbicide should be the first order of business following your spring clean up. The range of crabgrass control from these products is six to eighteen weeks. It is important to have pre-emergent down and active in the soil prior to crabgrass germination but not so early that you have crabgrass break through in June and July because the pre-emergent is no longer active. Pre-emergents tend to be extremely stable in the soil and will not move beyond the top two inches of the soil layer. Do read the label of your particular product. Most crabgrass pre-emergents will kill coy if you accidentally spread it into their pond. Remember that your crabgrass control is photosensitive. That is, sunlight will rapidly break down crabgrass pre-emergent in bare soil. Be vigilant along edges that may be scalped by timers or traffic. We can extend the definition of photo sensitive to heat sensitive as well. Crabgrass pre-emergents break down faster along curb sides and walk ways were heat radiates to lawn areas. A second application of pre-emergent in May or follow up applications of post-emergent crabgrass control in these "hot spots" is recommended. If you choose to attempt mechanical control of crabgrass mow the lawn regularly to control seed heads and physically remove crabgrass plants as they germinate. It is my observation that currently available organic controls to crabgrass are expensive and less than satisfactory. Crabgrass seed are viable for an extremely long time. I was told that when Pompeii was excavated that crabgrass germinated. That's a long time. Needless to say you will need to apply a pre-emergent each spring both to control crabgrass seed already present and those that will enter your turf through methods such as wind, birds or mowers.